I offer a Second World War Soldier Research Service. There are no medal rolls and only some soldiers have a medal card for medals, as defined in the introduction, awarded to soldiers who served in the British Army during the Second World War. Unless you happen to have documentation to hand which records a soldier’s medal entitlement, the only way to currently confirm what medals they qualified for is to order their service record. If a soldier claimed their medals, there will be a CS 20 Application for Issue of Campaign Stars and Medals which I discuss below but these aren’t currently accessible. Below are examples of medals recorded on a soldier’s Military History Sheet. When you apply for a service record you can never tell what documents you will receive but I have found that they nearly always include this page. The page is from the service record of my great-grandfather who served in the Royal Artillery and survived the war. The medals recorded are the Africa Star with 8th Army Clasp, 1939-45 Star, Defence Medal and War Medal 1939-45. Medals had to be claimed by the recipient and were issued unnamed. Below you can see the rectangular stamp which you should find somewhere in a soldier’s service record if their medals were issued. Often the stamp contains the abbreviation A.M.O. for Army Medal Office. Below is another example to my great-great uncle who died of disease while serving with the Royal Engineers. The clerk who originally wrote the medal entitlement made an error by recording the Defence Medal when my relative just missed out on it. The medals were issued to his widow in June 1948. Another place in the service record you frequently come across part of a soldier’s medal entitlement is in their Service and Casualty Form Army Form B.103. This is the most important document when researching a soldier and usually has survived in a file. You will typically find that if a soldier was awarded the Africa Star or qualified for the 1939-45 Star (initially known as the 1939-43 Star) early in the war, this will be stated on the form. Occasionally, a soldier’s entire medal entitlement is recorded. Below is part of my great-grandfather’s B.103 which recorded that he was awarded the Africa Star with 8th Army Clasp. His unit, 125th Battery 38th Light Anti-Aircraft Regiment is recorded on the left, he was in the Middle East (ME) at the time and his rank was Gunner (Gnr). If a soldier applied for their Second World War medals, and a large percentage didn’t, then there should be a CS 20 Application for Issue of Campaign Stars and Medals held by the Ministry of Defence Medal Office. There are over 1.5 million of these cards which a soldier filled out when they claimed their medals. They include a name, address and their army number, class and date of release and may contain additional information regarding the last unit a soldier served with and rank. The cards are used to check medal claims sent in by veterans and their next of kin. The cards haven’t been released. The only use of the cards I can see is if you’re trying to track down the service record of a soldier who you know applied for their medals. I often get emails from relatives who have applied to the Ministry of Defence and provided their relative’s exact date of birth. However, their relative provided a false date of birth and they don’t know their army number. As you need either an army number or exact date of birth to order to a file you hit a brick wall. A CS 20 card would provide both an army number and an address to confirm you’re looking at the correct soldier. However, as they haven’t been released I expect it may be difficult if not impossible to get the MOD to provide you with the information due to data protection. The first is John’s Medal Roll for the Queen’s South Africa Medal which is part of the WO 100 series held at the National Archives. These are available to download for free and are also indexed on Ancestry. The Medal Roll confirms John’s entitlement to the medal and the five clasps. Next is the Medal Index Card recording John’s medal entitlement for the First World War which is part of WO373 series at the National Archives. This is the type of document many people are hoping to find for Second World War soldiers and they can be viewed for free on Ancestry. 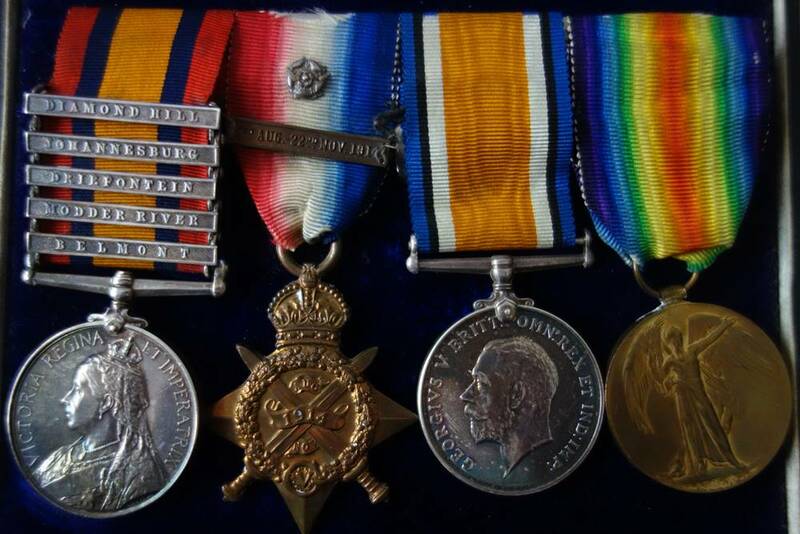 They confirm that John was entitled to the 1914 Star with clasp, British War Medal and Victory Medal. Finally, there are two First World War Medal Rolls in the WO 329 series at the National Archives. They are a 1914 Star Medal Roll and a separate British War Medal and Victory Medal, Medal Roll. They can be viewed on Ancestry. By consulting the above documents online, I quickly confirmed John’s correct medal entitlement. If only confirming Second World War soldiers’ medal entitlements was as quick and easy!